Introducing the “Blueberry Tardis”. 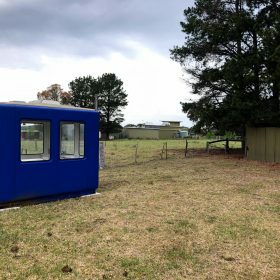 Our colourful site office is in place at Lakes Entrance Airfield and ready to open this weekend. Can’t promise you a “time machine” or “spacecraft” experience however a Scenic Flight will be the next best thing. Please Like and Follow Us on Facebook and Instagram. Check out our website lakesentrancehelicopters.com.au. See the amazing views you will enjoy when you take a Scenic Flight, there are 4 excellent choices available.